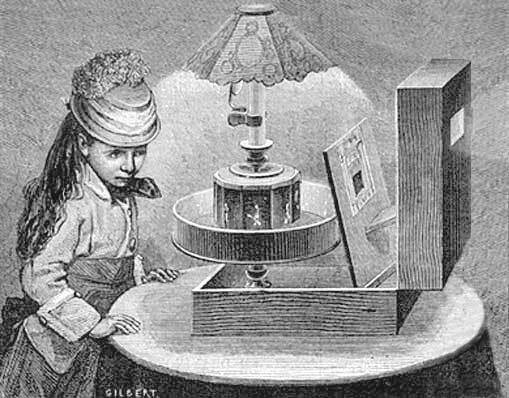 The praxinoscope was invented in France by Charles-Émile Reynaud in the year 1877. 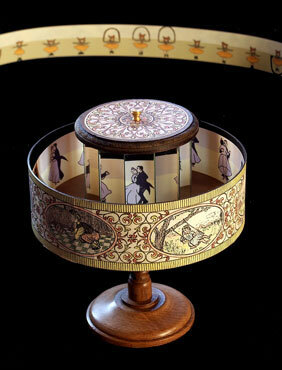 It was quite similar to its predecessor, the zoetrope, but differed in two significant ways. Instead of using viewing slits in a deep metal bin, the praxinoscope employed a ring of twelve flat mirrors—positioned halfway between the center of a much shallower container and its outer wall. A rectangular strip of images was placed inside the basket, as before, but it was upon the paper’s reflection in the device’s taller mirrors (and not the original artwork) that the viewer’s eye was supposed to be trained. Each “frame” of the strip corresponded to one of the mirrors, and the animation was looped.